Saracen was well known for its lush interior, described on several occasions as a “feast for the eyes.” Located at 141 East Bay Street in Charleston, SC, the restaurant occupied the Farmer’s and Exchange Bank building, a structure equally known for its appearance and brush with fate. Before Owner and Chef Charlie Farrell opened Saracen in 1990, the building served as office space for Sen. Fritz Hollings and was nearly demolished to make way for parking. 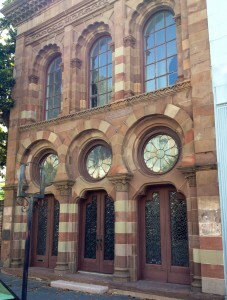 Saved in 1970, the building was restored and added to the list of National Historic Landmarks in 1973. The building’s architecture, Moorish and Spanish in style, is rare in the Holy City; this uniqueness nicely complemented the unexpected cuisine one would find inside. 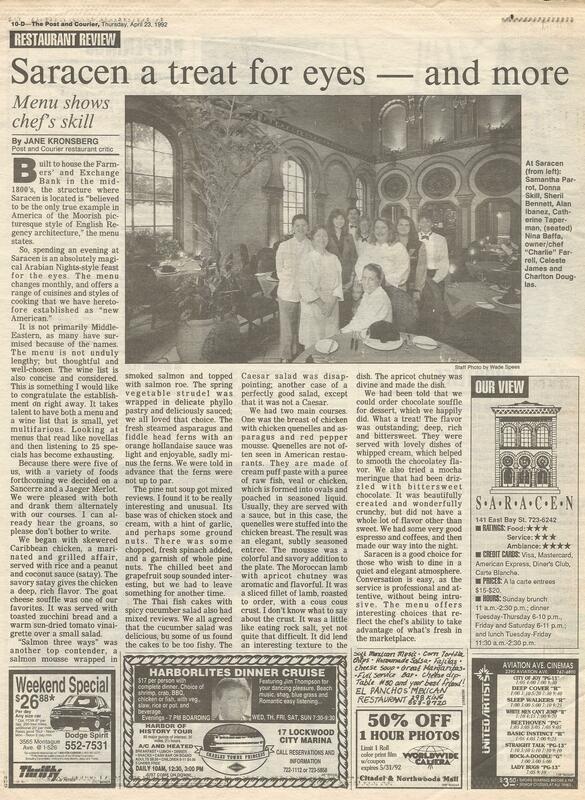 Former Post and Courier restaurant critic Jane Kronsberg reviewed Saracen on three occasions, in 1992, ’94, and ’98, detailing a pleasant experience each time. 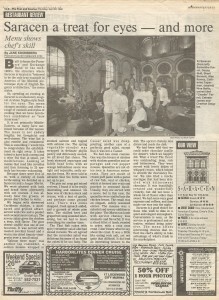 The cuisine featured Mediterranean and Asian ingredients and was described as new American with Middle Eastern flavor. 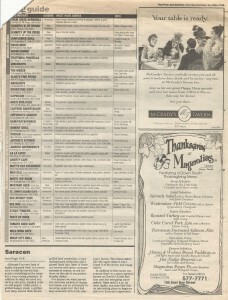 Like many restaurants of today, the menu at Saracen was small and changed regularly utilizing seasonal produce. Highlights of the menu included dishes like “salmon three ways,” chilled beet and grapefruit soup, Thai fish cakes, shrimp and pork egg rolls, apple and potato crusted trout cake, and coffee-rubbed quail. Saracen presented unique dishes including Cioppino, an Italian-American fish stew, and quenelles, creamed fish or meat combined with bread crumbs and light egg binding, a dish not often served in American establishments. Chef Farrell also infused Moroccan, Vietnamese, and Caribbean spices into his dishes creating a menu of eclectic offerings over the years. The establishment’s second floor was home to Charlie’s Little Bar (named for Farrell) and echoed the Moorish architecture, luxury, and comfort of the first-floor dining area. 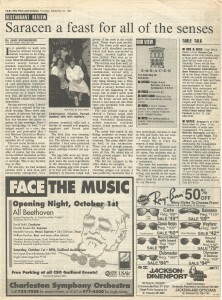 Kronsberg reported that the Little Bar attracted big crowds out for late weekend nights. The décor at Saracen, Kronsberg noted, provided a romantic atmosphere reminiscent of the mystery and magic conjured by stories of Arabian Nights. 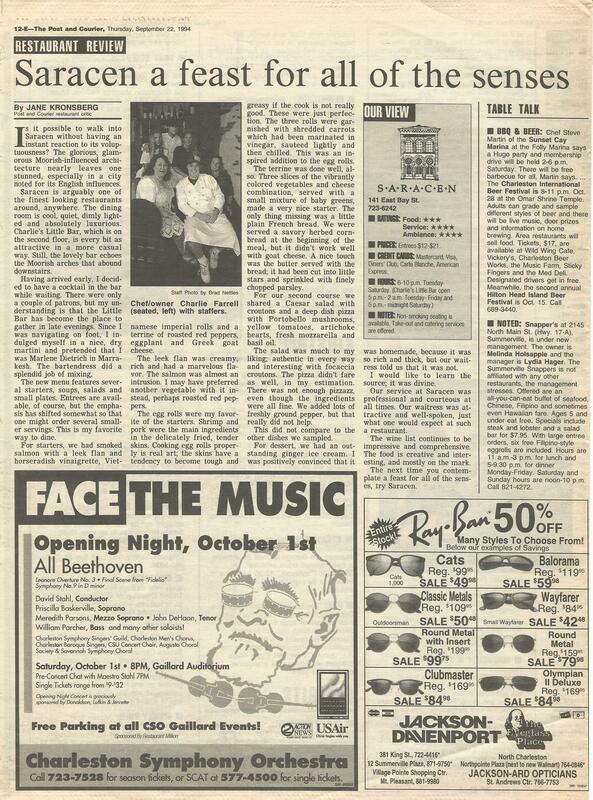 She described the restaurant as luxurious, glamorous, and “one of the best-looking restaurants around.” One last note, Kronsberg ranked Saracen’s decibel level at “quiet,” and in light of a recent Post and Courier report on restaurant noise, such a tranquil dining experience might be—like the Saracen—a thing of the past. 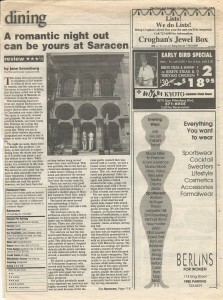 The building that housed Saracen for many years now stands vacant, hosting special events from time to time. We hope that a place this special and with so much history will once again come to life as some sort of amazing culinary gem for the city.